A full body treatment fully clothed. Focus is on purifying meridians or what is called pans lines corresponding to internal organ health. You are stretched out deeply throughout session. Reiki: $60/hr. or donations depending on situation. Gentle hands-on healing through therapeutic touch or what’s called “Energy Work” from a 1st, 2nd or 3rd degree Reiki practitioner. Client is fully clothed. No manipulation of the soft tissue involved. Particularly good for stress relief, cancer patients, mental, spiritual and physical. Pre-natal massage or CranioSacral therapy $75/hr. 2nd or 3rd trimester only. Focus is on relaxation and tension relief of lower back and neck. Certain places on ankle and wrists will be avoided. Recommended for Aromatherapy is Grapefruit, Orange, Lemongrass. No Lavender. Avoid perfumes. 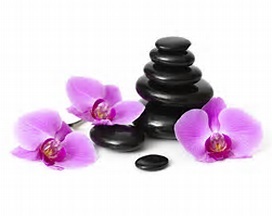 Hot Stone Massage: $130/75 min. *Office only Heated river rocks placed and used as massage tools. Deep relaxation. Swedish and Deep combined techniques. Reiki Sharings: A group sharing for anyone with previous Reiki training to practice and treat each other. Please contact us for more information. If you are interested in taking a 1st Degree or 2nd Degree Reiki course these please contact Kathy if you are interestedin organizing a group of 3 or more students. Would require three- four days of training for each degree. Learning this method is great for Self-care.